Muni busses and light rail vehicles are the new canvasses for Getting to Zero’s latest project: an awareness campaign. These ads, which were created by Positive Resource Center, discuss the rising cost of HIV treatment and the ways people living with HIV in San Francisco can access care without breaking the bank. According to the Centers of Disease Control and Prevention, the average annual cost of HIV care for antiretroviral therapy (ART) is $23,000 annually. This amount is unaffordable to many San Francisco residents due to the high cost of living in this area. 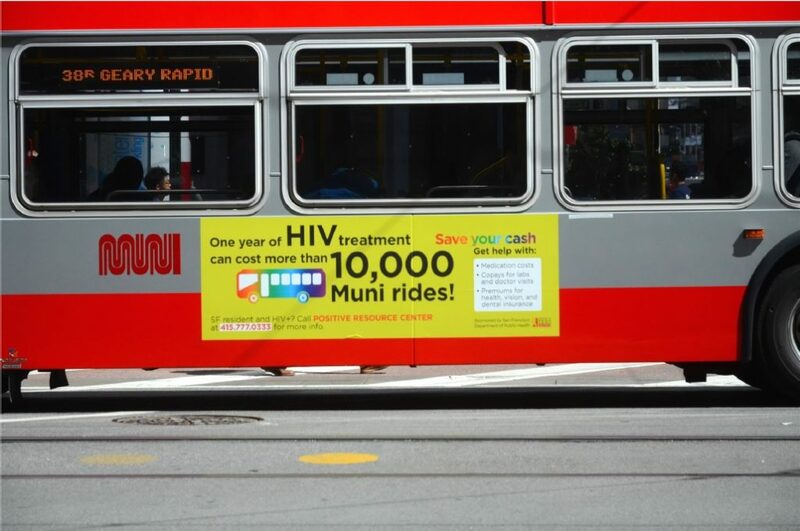 The advertisements compare the annual cost of HIV treatment to other annual, monthly, or daily expenses such as purchasing a one way Muni ticket or a monthly gym membership. Advertisements can be seen on Muni bus and light rail vehicles and through Out Magazine and The Advocate’s online versions in San Francisco. They are also being distributed through Grindr (the world’s largest gay social network app). The goal of the awareness campaign is to encourage retention and re-engagement in HIV treatment by bringing awareness to programs like the Office of AIDS Health Insurance Premium Payment program (OA-HIPP) and the AIDS Emergency Fund Health Insurance Premium Payment program (AEF-HIPP). These programs help pay for medical copays and insurance premiums. In so doing, they make treatment possible for many San Francisco residents who would otherwise go without. Positive Resource Center acts as a linkage to these and many other programs for making HIV treatment more affordable. Rebecca Levin is the Communications Coordinator with the Benefits Counseling Program at Positive Resource Center. She is a member of the Retention & Re-engagement Committee and Communications Subworking Group.